Christian Palmaz indicated over two years ago that he hoped the helipad on his Genesee Valley Ranch property could be put to good use by local authorities in case of medical emergencies. That vital use of the helipad has come to pass. 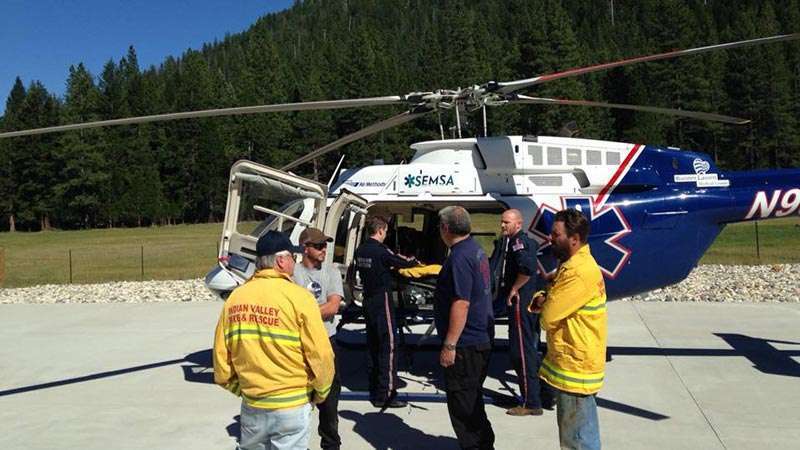 Local first responders Indian Valley Fire and Rescue, PHI (ground ambulance), and Care Flight had scheduled a training event on the property July 3, but got a call June 30 to go into action. The helipad was used to medevac an injured motorcyclist. There was a crash near Genesee on June 30 and the helicopter ordered was able to successfully land and medevac safely. The crash victim was later reported to be doing well. “This is one example of how a community comes together, helping each other,” the Indian Valley Fire and Rescue said in reference to the incident. They also thanked the Genesee Valley Ranch for providing the space. “When first responders need to save a life, property boundaries can sometimes become obstacles to the task at hand. Our goal was simply to provide access to our resources and allow training so that they may be better prepared in the event the unthinkable happens,” said Palmaz of the June 30 incident. While an emergency helicopter can technically and legally land where it needs to, the uneven terrain, power lines, debris in tall grasses, etc., unseen from the air can all make doing so difficult. It can also eat up precious time. Having a consistent environment on which to land safely is a real benefit, according to both first responders and Palmaz. “We are really honored that our helipad was able to play a role in providing emergency care to someone in need. The first responders who called on the accident demonstrated incredible prowess. We are extremely grateful to them for their dedication and service,” said Palmaz. “Once controversial” is a ridiculous statement considering the paper’s op-ed pages have been filled with both sides of this raging debate. Obviously the helipad is **still controversial** in our community. Enough fake news thanks! This is only a single example of what it means to have helipads, air strips, helicopters and little airplanes as “neighbors.” Few people appreciate the importance of general aviation and its contribution in times of real need. So when the call comes, it’s those neighbors and communities that have helipads and landing strips along with those who can fly that will be pressed into service. And unless you actually fly a helicopter you have no idea how much safer and faster it is to land on a prepared pad than it is to figure out someone’s yard. People in Genisee valley who have been critical of Palmaz who put in the helipad should think twice about their complaints and what might happen if it were they that needed that flight. It is pretty clear to me this is a quid quo pro deal in order for palmaz to keep his illegally built airport. When agendas and public opinion can be bought, then we’ve lost everything that makes plumaz county, oops, I mean plumas county great. Yep they had the motorcycle rider crash so that they could have this quid pro quo news article. Are you delusional? If this is a quid pro quo I’ll take it any day in a New York minute. If I were an hour plus away from the nearest medical help I’d be happy one of my neighbors were willing to support that and pay for the facility. Maybe “Me” will have a different attitude when it’s their family member, neighbor, or friend that is in a “staged” motorcycle accident, or a similarly “staged” heart attack, hiking or bicycling injury, or just plain sick in the middle of the impassable winter. Then again maybe they have no family, neighbors or friends they care about, or that care about them. Quid quo pro, Please quote where I said it was a staged accident, or you be known as a liar like Jim stabiston. Thanks. Gotta agree wholeheartedly with “Quid for Quo”. It’s very sad how unhappy some people are. I have just read two positive, uplifting articles, trying to spread some good news instead of the usual gloom and doom, and the same person rips both the articles, authors, and other commenters apart. Maybe if Plumas County and the people in it are so horrible, “me” should move somewhere else. Somewhere with with no helipads or airports when they or a loved one have a life-threatening emergency. Gotta agree wholeheartedly with “Quid for Quo”. It’s very sad how unhappy some people are. I have just read two positive, uplifting articles, trying to spread some good news instead of the usual gloom and doom, and the same person rips both the articles, authors, and other commenters apart. Maybe if Plumas County and the people in it are so horrible, “me” should move somewhere else. Somewhere with with no helipads or airports when they or a loved one have a life-threatening emergency. Thanks, Plumas News, for sharing something positive with us! Beadkat, no need, it’s Trump supporters that are always threatening to leave “commiefornia” good riddance. I am so thankful for people willing to share a part of the land and themselves for the needs of others when it is needed most.